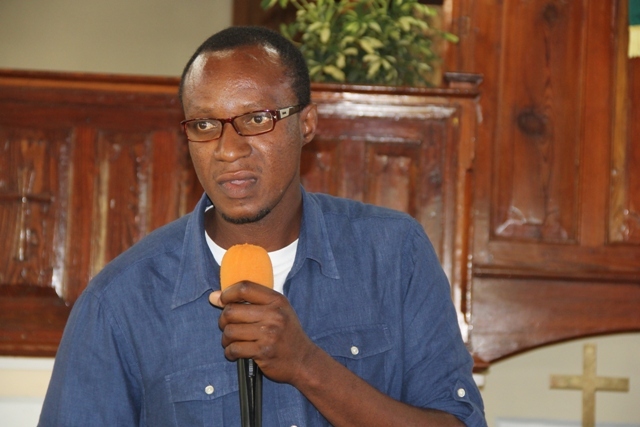 NIA CHARLESTOWN NEVIS (January 25, 2018) — Serving a sentence of any kind is not the best experience, a sentiment expressed by prison inmate Mr. Marieus Webbe of Gingerland when he addressed students of the Gingerland Secondary School (GSS). 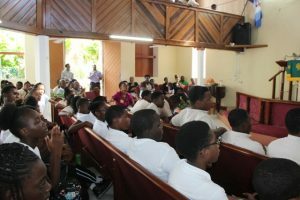 The student body and staff were at the time attending the school’s 45th Anniversary Thanksgiving Service at the Gingerland Methodist Church, on Wednesday January 24, 2018. Mr. Webbe who is a past student of the school graduated with three Caribbean Examination Council (CXC) subjects told them of his unfortunate experience and how it changed him. “At age 21, I was gainfully employed but at age 22, I made a real regrettable choice. Remember this students, you’re free to choose but you’re not free from the consequences of your choice but never be defined by the consequences of your choice. “I am now in prison, serving a sentence, a rather long one but it didn’t stop me. I entered programmes, education being at the forefront. I have now five additional CXC subjects: English, Principles of Business (I), Economics (I), Accounts (I), Mathematics (II) but you don’t stop, you continue going,” he said. Mr. Webbe, also stated that he sat subjects at the Caribbean Advance Proficiency Examination (CAPE) level and has passed Integrated Maths, Communication Studies, Caribbean Studies, and two units of Management of Business. He is currently in his final year towards gaining an Associate’s Degree in Business. Mr. Webb further explained that he tutors other inmates, students from various schools and adults. “I have a famous quote from Mr. Martin Luther King: “Intelligence rules the world and ignorance bears the burden.” My advice to you, avoid ignorant choices… The choice you make today determines who you may be tomorrow. So beware of your choices,” he told the students.